As I have mentioned in previous posts, the purpose of Iran Alive Ministries is to plant churches through the vehicle of satellite TV. With an estimated audience of 3-6 million viewers at any given time, our network has been the bane of the Iranian government for years. Just today, one of our close friends heard from family inside Tehran that the government is again confiscating satellite dishes. While illegal to own in Iran, the BBC estimates that 80% of Iranians have access to satellite TV. 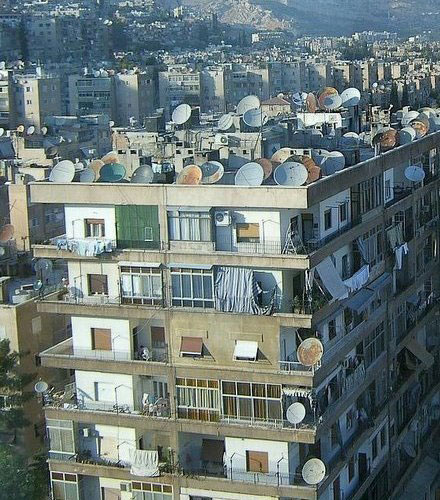 In fact, if you look at photos of most Iranian cities, you will notice the pervasive presence of satellite dishes on nearly every rooftop and balcony. I have mused that the satellite dish is the true “National Flower” of Iran. Typically, within 24-48 hours of these types of raids, the dishes are sold back the original owners on the black market. Many people own two dishes for this very reason…one to use and one to keep as a backup. Satellite TV provides millions of Iranians with their only connection to the outside world and a direct connection to the Gospel. Join us in praying that the Lord will use this latest crackdown as a opportunity to further strengthen the resolve of the Iranian people to seek the truth and find it in the only One who truly embodies Truth. Praying for you & our brothers & sisters in Iran here at IHOPKC during this crackdown Hormoz.